Home of the Eastern Massasauga Rattlesnake! Massasauga rattler sunning on the Indian Springs Metropark hike-bike trail. 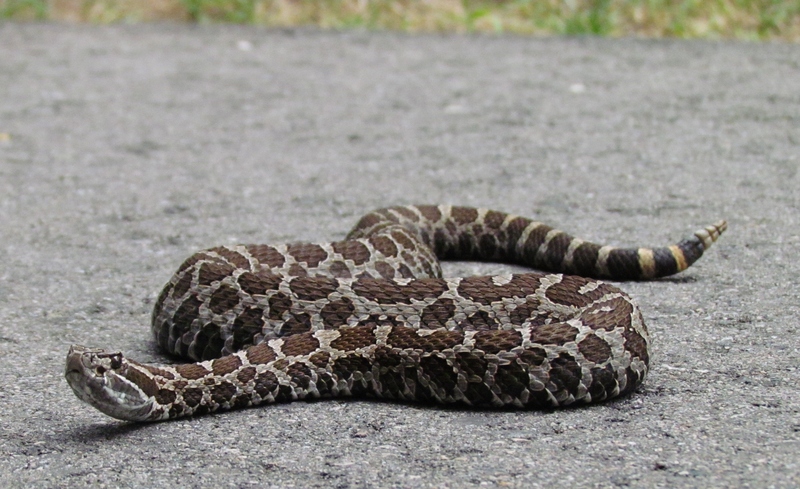 The Eastern Massasauga Rattlesnake is a true pit-viper; the only venomous snake found in Oakland County. They are well camouflaged, docile and secretive and would rather escape than strike when threatened and that may explain a fact noted by emergency medical professionals: on the rare occasion when a rattlesnake strikes it almost always occurs on the dominated hand of an intoxicated male. “Hey Joe, Watch at this!” may just summarize the foolish bravado behavior that precedes most encounters between two species, homo sapiens and Sistrurus catenatus catenatus. Humans are not on the menu, but these highly skilled ambush hunters use their heat -seeking pits to target small rodents and frogs.